Economic sentiment improved in Germany and the EU but fell short of turning positive. Trade war returned to the spotlight in detriment of high-yielding EUR. 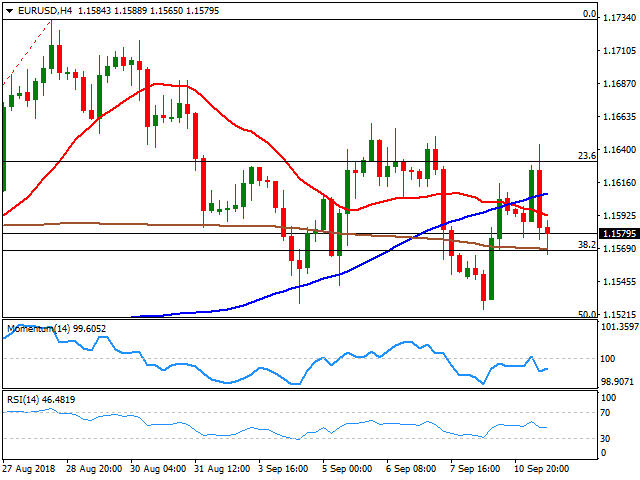 The EUR/USD pair rose to 1.1643 but suffered a sudden reversal and fell to the current 1.1580 region as risk aversion kicked in, following news that China is retaliating to US menaces although through a different channel. This time, the Asian giant asked the WTO authorization to impose sanctions on the US, citing a US non-compliance in 2017 trade dispute ruling as an argument in the case. Data coming from the EU was mostly encouraging, as the German ZEW survey showed that local economic sentiment improved more-than-expected in September, with the indicator climbing to - 10.6 from -13.7 in August, thanks to a better assessment of the current situation, as this last was up to 76 from 72.6. For the whole EU, Economic Sentiment improved to -7.2 from the previous -11.1, all of them, beating expectations. Another good news is that employment in the EU increased by 1.5% in the three months to June. In the meantime, European equities and US futures remain under pressure, trading at multi-week lows. Yields rose just modestly with the yield on the benchmark 10-year note currently at 2.95%. The US calendar has nothing of relevance to offer today. Already released, the NFIB Business Optimism Index for August came in at 108.8 up from the previous 107.9 and also above the forecasted 108.2. Later today, the country will release July JOLTS Jobs Openings and Wholesale Inventories. The pair failed once again to overcome the 23.6% retracement of its August rally around 1.1630 and is now pressuring the 38.2% retracement of the same advance at around 1.1570. The pair has been holding ever since the month started, below the mentioned 1.1630 area and above 1.1520, the next Fibonacci support. In the 4 hours chart, the pair is stuck within directionless moving averages, while technical indicators were unable to re-enter positive territory, and are now without directional strength within negative levels, skewing the risk toward the downside without confirming it. A steeper decline is likely on a break below 1.1530, where the pair is lately meeting buying interest.